Birthdays are so much fun, but can be so much work sometimes! We don’t always do a lot of entertaining, so when we have guests over for birthday parties I always have “performance” anxiety. “Is my house clean enough?”. “What if my food doesn’t turn out?”. Silly things to be sure, but they still nag at me. I have to choose to ignore that mental clutter! When it comes to entertaining, I try to keep things really simple and something that I know will taste good. Typically no new or complicated recipes when we have people over, but this recipe was the rare exception. My son just had a birthday the other day and he decided he wanted an Oreo cheesecake instead of a regular cake this year. I had an idea in my head of how to make it, but I wasn’t 100% sure it was going to turn out. I flew by the seat of my pants with this one and crossed my fingers (pretty rare when we have people over). It turned out awesome! Just a note about this recipe: it is not what I would consider healthy. It’s not low sugar, low calorie, or low fat, but it is allergy-friendly and delicious (no peanuts, dairy, or eggs, and it can be made gluten free). Since I made this for my son’t birthday, I made it allergy-friendly without worrying too much about sugar or calories. I debated about whether I was even going to post this recipe or not since it isn’t very healthy, but I decided to post it anyway since it’s allergy-friendly and I don’t want to hide the fact that I like dessert. I love healthy and balanced food, but I also like having a high-calorie treat sometimes too. And sometimes I eat too many sweets and snacks. I don’t want people to believe that I’m perfect or that I’m ultra-extreme-crazy strict with my food. I’m not. I believe in balance! This cheesecake is quite thick and rich, but it’s delicious (even friends with no food allergies loved it). If you want to watch your portions, feel free to cut this into more than just 8 slices if you want to make the portions smaller or opt for a half slice if you want to avoid over-doing it. We made this recipe with regular Oreos since my kids can have those, but if you want to make this recipe gluten free, you can find some gluten free sandwich cookies to use instead of Oreos (several brands like Glutino and Kinnikinnick make them, just check the labels for other allergens like soy, nuts, or dairy if you have multiple food allergies). The Kinnikinnick brand sandwich cookies are soy free, peanut free, gluten free, and tree nut free, so they are a great allergy-friendly option in this recipe. The recipe will stay the same regardless of which brand of sandwich cookie you decide to use. If you want to make this recipe gluten free, get instructions for our gluten free cookie crust in our Triple Chocolate Cheesecake recipe, and replace the Oreo cookies in the filling with Kinnikinick sandwich cookies (they are nut free, dairy free, and gluten free). The plain Oreos have small amounts of soy lecithin in them, so they aren’t completely soy free. If you have soy allergies those might not bother you, but check around for soy-free brands of sandwich cookies if that is a concern. 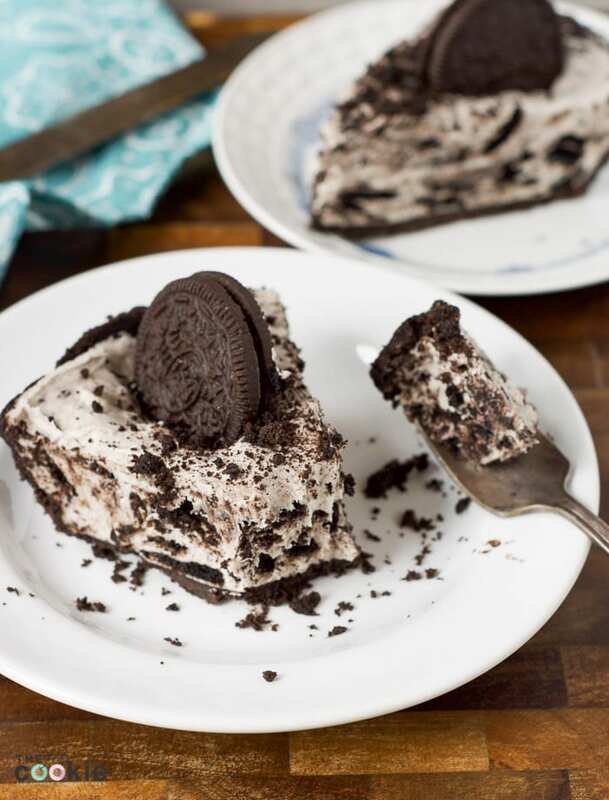 Those small amounts of soy lecithin usually aren’t a problem for us, but I just wanted to notes that this recipe isn’t completely soy free if you use Oreos. Also, some flavors of Oreos or other sandwich cookies are made in a facility with nuts. The plain Oreos we get are not made in a facility with nuts, but some of the other flavors of Oreos are, so read the label each time you buy them if nut allergies are a concern. Manufacturers change recipes or facilities sometimes, so it’s good to check those labels regularly even if you have been buying a product for a long time. Looking for an easy sweet treat for friends with food allergies? 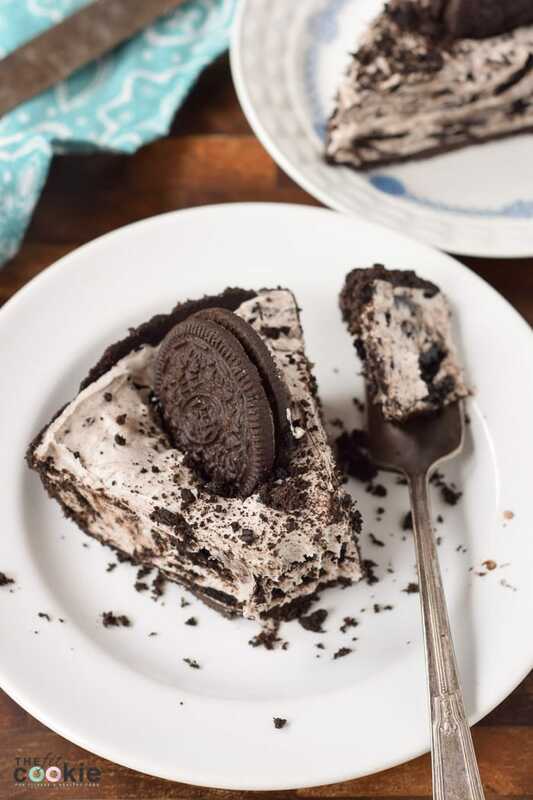 Make this Easy Oreo Cheesecake! It’s dairy and egg free with a gluten free option! In a medium bowl, beat the Daiya non-dairy cream cheese until it is softened. 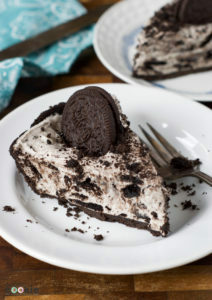 Spread evenly into the Oreo crust (or your homemade crust), and place an Oreo where each slice would be (if you want) to garnish. Cover, and refrigerate for several hours (we let this chill overnight). The cookies will soften and the cream cheese mixture will set up as it chills. Delicious! I made this for Christmas, and want to try it next with the peppermint bark Oreos and peppermint extract. I also made your pumpkin cheesecake recipe for thanksgiving, and it was a hit, too! Thanks for the recipes! You’re so welcome! The peppermint idea sounds really good 🙂 I am planning on posting a strawberry cheesecake for Valentine’s Day, stay tuned! My nephew has a severe dairy allergy and I made this pie for him for Thanksgiving. He was thrilled! He said it tasted amazing. It disappeared so fast among family that I didn’t even get a bite to try it for myself. Thank you for sharing this. Thanks so much Deb, I’m so glad to hear that this worked out great for you guys! What can you use instead of the coco whip? Is there an alternative? I’m allergic to coconut, nuts, and I’m gf and vegan. Thanks! Hi! 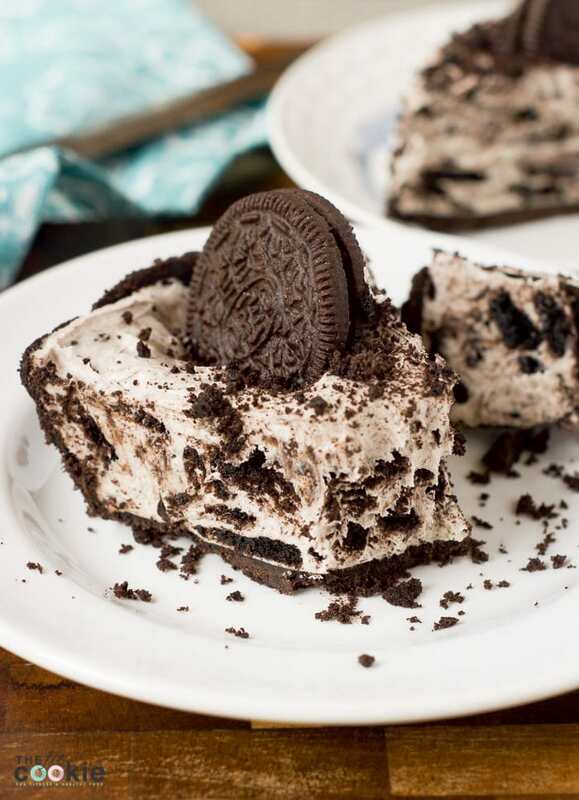 Would I be able to use this exact recipe to make 24 mini Oreo cheesecake cupcakes or would I have to possibly double the recipe? Thank you!! Hi Lauren! I haven’t used this to make mini cheesecakes so I’m not 100% sure, but I think if you are making mini cheesecakes with regular-sized muffin pans, I’d double it to make 24. I think one batch would fill 12 fine but not 24. You could use silicone muffin liners (probably the easiest way) or a silicone muffin tin using the method in this recipe (https://thefitcookie.com/mini-dairy-free-strawberry-cheesecake/) where you freeze them enough to pop them out of the silicone muffin pan, then put them in the fridge to thaw a bit before eating. Anyone leave it in the freezer overnight to serve the next day? Hello! Just made 2 pies and can’t wait to see how they turn out! I made my own pie crusts using Oreos (cookie and cream and all) and my own coconut whipped cream since we have a pea allergy and sodelicious’ contains pea protein. So I found the filling to be a bit liquidy and wish I hadn’t put as many cookies too (for the look as the taste is great!) but have put the pies in the freezer hoping that will solidify a little for my event tomorrow. Anyone else freeze i/o refrigerate this pie overnight before? I haven’t tried leaving this in the freezer overnight. I think with the ingredients as listed, it probably would be fine, but if you change the ingredients then I’m not sure. I’ll have to try that out next time I make this again. Let me know how it goes for you! I can’t wait to make these. Having to be dairy free really makes you miss cheesecake!! I plan on using Trader Joe’s regular vegan cream cheese since that is what I like. I love the CocoWhip! So glad to have found that a few months ago! I like to spread it on a gingersnap cookie for a treat. I am wanting to make individual cheesecakes using cupcake liners and wondered if you have done this? I’m not gluten free so for the crust I thought I’d mix the oreo’s with my earth balance sticks. I do have coconut oil but wonder if it gives the crust a heavy coconut taste? Thanks! So, I have made this 2x now. The first time I used Miyoko’s plainly classic cream cheese and made it into a Kroger already prepared chocolate crust. This was my first time buying Miyoko’s. This cream cheese has a very distinct flavor. Tart, I would say almost a vinegary or lemony taste? I love lemon and I liked the pie enough but didn’t love that weird tang. I made this again using Trader Joe’s cheese. I prefered TJ because you didn’t have that weird tartness with the Miyoko’s. I also made them into cupcake style cheesecakes the second time around. I have found for me that I prefer vegan cream cheeses with a soy base (TJ) vs an almond base (M). The end result is my family liked both. I will definitely make again but keep on using TJ cream cheese. Of course it’s personal preference on whether you want more of a tang in your oreo cheesecake. I think both will get eaten but I like TJ price of $2.50 over $6-$7 (M) for 8oz of cream cheese. Thanks for a great recipe and I know I’ll make this again and again. Next time I make into cupcakes, I’d probably add more of my earth balance stick. I didn’t think the oreo’s stuck together enough. That might just be because it’s not real butter. Miyoko’s is made with cashews not almonds. Thank you for the update Leslie! Can Eggs be used in this if wanted? Hi Del, I would not recommend using eggs in this recipe since this cheesecake is no-bake. If you added eggs, you would have raw eggs in your cheesecake, so I would avoid that. If I make my own crust, do I leave the icing in the oreos? I haven’t made my own oero crust before, but I think traditionally it’s made without the cream inside then with non-dairy butter added to hold it together. Yes. Just put the whole cookies in the food processor. Your crust will come out great and very crunchy. I used a dairy free butter alternative in the crust as well so the whole pie was dairy free. Very yummy! this looks soooo good! My 3 year cannot have eggs or dairy, but she LOVESSSS her oreos. She loves the golden ones though. I am thinking of trying this with those and wonder if it would still be good?? Could either use the graham cracker crust or make my own golden oreo crust maybe?? Do i thaw the cocowhip before mixing ? How far in advance can I make this dessert? Do the cookies start getting too mushy after a day or two? Hi Renee! The cookies will soften over time, I would make this day you plan to have it or the day before, I probably wouldn’t make this more than 1 day before you plan to have it since the cookies do get soft. Okay forget that I said mud pie what I meant to say was dirt cake. That is exactly what it taste like to me ?? Why not use toffuti or kite hill cream cheese instead?? Thanks! I think I’ll try it with the daiya for my first time since you already know it’s good this way and then experiment with different vegan cream cheeses. Any non-dairy cream cheese should work in this recipe if it’s nice firm, let me know how it turns out if you try it with another brand! Hey!! Do you leave the cream in the Oreos when you mash them up to put in the cake or do you just use the cookie part?? Thanks! I’ll share this to my cousin. Just what they need, her kids are allergic to eggs and dairy 🙁 Thanks for posting! Thank you Bethany! It is seriously delicious – and super rich!